Listing duration is the amount of time your listing will be active in eBay and available for your customers to purchase it. It varies between 7, 10, 30 or "until canceled by the user" (aka GTC). Selecting the right duration for your listings plays a major role in your selling strategy. In DSM, we support all of the listing duration under “Fixed Price Format”, listing your items in your own price and your buyer can purchase it immediately. 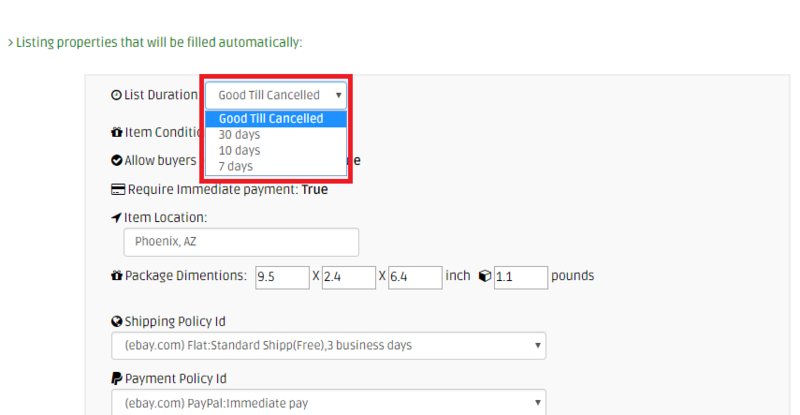 What is a Good till Canceled listing (GTC) ? One of the many formats under which you can create your listing on eBay is called the Good Til Canceled (GTC) listing. Under this format, your listing will be created for a duration of 30 days. It will be a fixed price listing and at the end of the 30 day period, your listing will automatically get renewed and list again. This continues to happen after every 30 day period till such time that the seller cancels the listing. Using the GTC format on our eBay listings will help us build trust. What happens to a listing in a different format in the Monitor ? Once the item will be sold on eBay, and the quantity will reach 0, the listing will automatically end, and a green “Relist” button will appear in DSM. Clicking the button will relist the item on eBay on GTC Format even if it is set to another duration. How can I list items using different Listing Duration in DSM? We know that every listing duration has its own purpose and eBay will not put all of those without any reason. So, DSM also opens the opportunity for our valuable customers to list items using different Listing Duration other than GTC. To do that, you have to go to the Settings of your account and under the Monitor tab you will see the Protection Settings. Since you can't set the item quantity to 0 when it's not GTC, you have to select "Double the Target Price" option so that the other Listing Duration will be enabled. After you select "Double the Target Price" option, you have to click the Update button at the bottom part of the page. Now, In the Rapid Lister section, paste the source link of the item that you want to list then click "Import". Once the source link is imported, go to the listing properties and that is where you can change the listing duration to 30 days, 10 days, and 7 days depending on your selling strategy.